Showing 61 - 75 of 522 articles tagged "Saturday Night Live"
Ahead of their likely joint appearance on SNL this weekend, Mulaney and Davidson played "True Confessions" with Jimmy Fallon. The former Saturday Night Live revealed he first auditioned in 1975, seven years before he was born. "I'mma be honest," the rapper said of the May 2018 digital short in a GQ video. 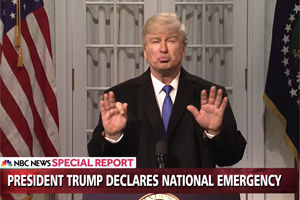 President Trump's SNL complaint is an "oddly sensitive reaction" for a president who ran as a "tough guy"
Alec Baldwin worries President Trump's SNL "retribution" tweet is a "threat to my safety"
Watch the newest installment of Late Night's "Second Chance Theatre.